Domaine des Senechaux has a long history in the Chateauneuf du Pape appellation. At least the previous owners did. The Raynaud family, the previous owners of Domaine des Senechaux can date their history in the southern Rhone all the way back to the 14th century. The domaine took the inspiration for its name from the small area, or lieu dit the vines are located in, Bois Seneseau. The Raynaud family sold the vineyard to Pascal Roux in 1993. Pascal Roux was an experienced vintner at the time of the purchase as he was already making wine in the Gigondas appellation with his estate, Chateau du Trignon. After purchasing Domaine des Senechaux, he began a program of replanting the vineyards and modernizing the wine making facilities. However, the Roux family ended up selling the estate to the Quiot family. The next chapter in the story is both interesting and complex. In December 2006, the Quiot family prepared to sell Domaine des Senechaux to Jean Michel Cazes, the owner of Chateau Lynch Bages in Bordeaux. Local winemakers from Chateauneuf du Pape fought the sale. The group of 20 winemakers made an offer to purchase the vines of Domaine des Senechaux. If that sale had gone through, they would have divided the vines among themselves. 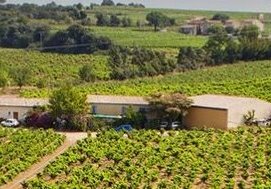 Domaine des Senechaux was sold and to the Cazes family and today, the property is managed by Jean Charles Cazes, who also manages Chateau Lynch Bages, as well as several other estates for the family. The Domaine des Senechaux vineyard consists of 25.3 hectares of vines. 22.3 hectares are reserved for the production of red Chateauneuf du Pape wine. 3 hectares are devoted to growing white Chateauneuf du Pape grapes. While their vines are spread out across the appellation, their best terroir is located in the Bois Seneseau lieu-dit with its rock, pebble, clay, limestone and loam soils. The best vintages of Domaine des Senechaux are: 2018, 2017, 2016, 2015, 2012, 2010, 2009 and 2007. Domaine des Senechaux produces 1 red Chateauneuf du Pape wine and 1 Chateauneuf du Pape Blanc. Domaine des Senechaux Rouge is a blend of 64% Grenache, 19% Syrah, 15% Mourvedre, 1% Cinsault and 1% Vaccarese. Destemming takes place on some of the grapes. The wine is aged in a combination of vessels that includes old, French oak barrels, foudres and cement vats for an average of 12 to 14 months before bottling The production is close to 7,300 cases per year. Domaine des Senechaux Blanc is produced from a blend of 33% Roussanne, 29.5% Clairette, 29.5% Grenache Blanc and 8% Bourboulenc. Close to 1,000 cases are produced each vintage. Domaine des Senechaux can be enjoyed on the young side. Young vintages can be popped and poured, or decanted for about 1 hour, give or take. This allows the wine to soften and open its perfume. Older vintages might need very little decanting, just enough to remove the sediment. Domaine des Senechaux is usually better with 2-4 years of bottle age. Of course that can vary slightly, depending on the vintage. In the best vintages the wine should be consumed within 4-14 years after the vintage. Domaine des Senechaux is best served at 15.5 degrees Celsius, 60 degrees Fahrenheit. The cool, almost cellar temperature gives the wine more freshness and lift. Domaine des Senechaux is best served with all types of classic meat dishes, veal, pork, beef, lamb, duck, game, roast chicken, roasted, braised, stewed dishes, sausage, barbecue and cassoulet. Domaine des Senechaux is also good with Asian dishes, hearty fish courses like tuna, mushrooms, cheese, pasta, eggplant and tomatoes. The white wine of Domaine des Senechaux is best served with a myriad of different seafood dishes, shellfish, crab, lobster, sushi, sashimi, chicken, pork and veal, as well as Asian cuisine. The Cazes family owns an additional 1.2 hectares of vines that are not in the appellation. Spicy, silky, lush, sweet and supple, the fruits show off their spicy character with little effort. This elegantly, styled wine is soft, with a peppery, kirsch filled finish that keeps on going. This is the best vintage yet for Senechaux. The wine is made using mostly Grenache, with Syrah, Mourvedre, and various other allowable, grape varieties. On the nose you find black cherry, pepper and herbs with little effort. Medium bodied, fresh, sweet, soft and forward, the wine is already easy to drink. It is nice in flavor and round in texture, but it’s a bit short in the fruity finish. Ripe red fruits, garrugue, thyme and peppery aromatics team up with a medium bodied, fresh, forward, soft, earthy, spicy blast of kirsch that carries through. This is already starting to be fun to drink. Silky, dense, lush textures, a beautiful purity of fruit with ripe, sweet, red and black fruits and long, spicy, mouth filling finish. Consulted by Philippe Cambie. Ready to go, if you them young, lusty, full of sweet, juicy, peppery, ripe black cherries, jammy black raspberries, kirsch, spice and fat, plush textures.